We introduce a novel depth recovery method based on light absorption in water. Water absorbs light at almost all wavelengths whose absorption coefficient is related to the wavelength. Based on the Beer-Lambert model, we introduce a bispectral depth recovery method that leverages the light absorption difference between two near-infrared wavelengths captured with a distant point source and orthographic cameras. Through extensive analysis, we show that accurate depth can be recovered irrespective of the surface texture and reflectance, and introduce algorithms to correct for nonidealities of a practical implementation, including tilted light source and camera placement and non-ideal bandpass filters. We construct a coaxial bispectral depth imaging system using low-cost off-the-shelf hardware and demonstrate its use for recovering the shapes of complex and dynamic objects in water. Experimental results validate the theory and practical implementation of this novel depth recovery paradigm, which we refer to as shape from water. in Proc. of European Conference on Computer Vision ECCV’16, pp635-649, Oct., 2016. (a) Water absorbs light in varying ratios in the near-infrared range. (b) We model this near-infrared light absorption based on the Beer-Lambert Law, which enables us to measure the depth of water and in turn the shape of an object submerged in water using two near-infrared observations with (c) a coaxial camera-illuminant setup, and also the general case of (d) when the two are not aligned. With a newly collected extensive reflectance spectra database in the Vis-NIR range from 400 nm to 1400 nm, we empirically show that the spectral reflectance difference for two close near-infrared wavelengths is negligible. We built a co-axial bispectral imaging system for shape from water. The system uses co-axial cameras to simultaneously capture the scene in two wavelengths, recording bispectral image pairs at video-rate. From the image sequence, we may recover the geometry of complex and dynamic objects immersed in water. (a) Our co-axial bispectral imaging system. 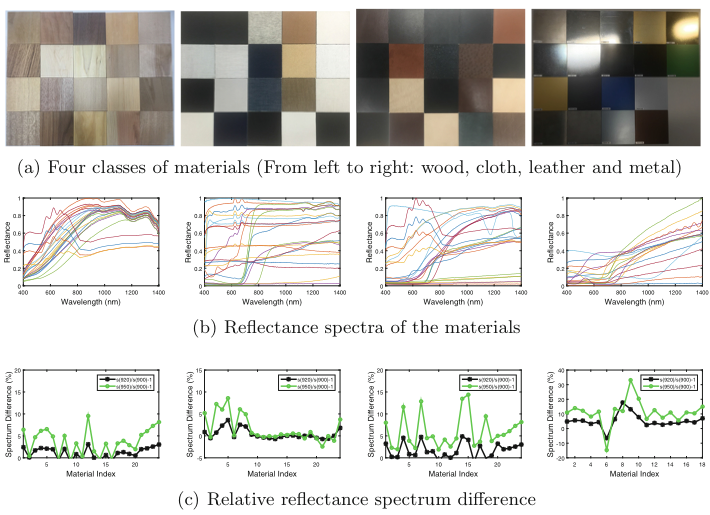 (b) The spectral response functions of the camera and the two filters. (c) The spectrum of the incandescent illuminant. (d) The calibrated water absorption coefficient. 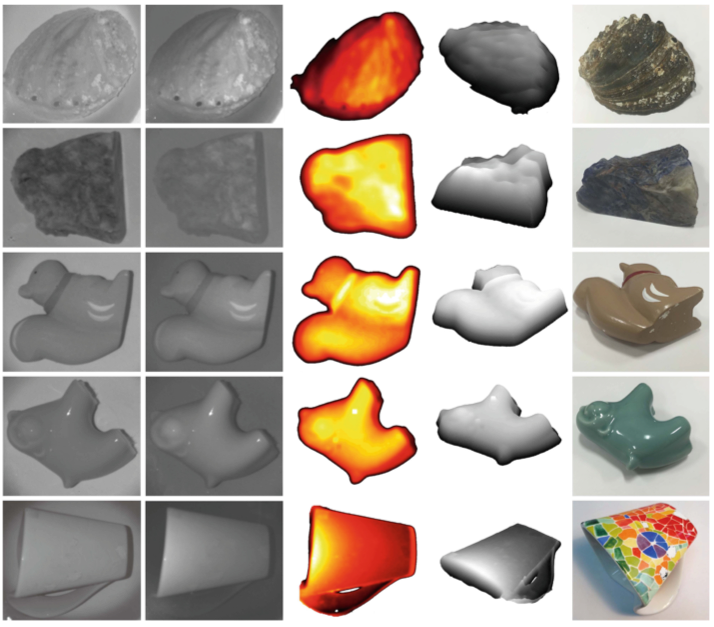 Shape recovery of objects with complex geometry, texture, and reflection prop- erties. 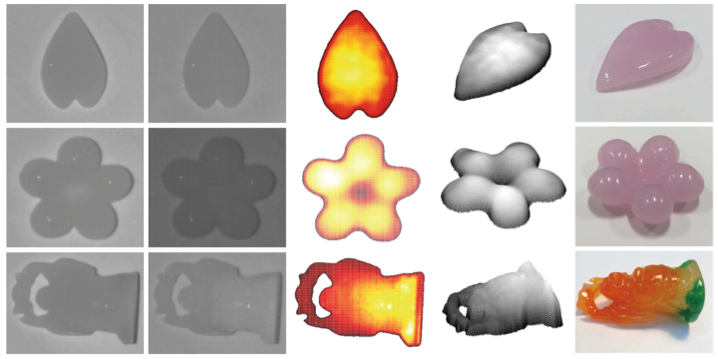 For each row, from left to right, the input images at 905 nm and 950 nm, the depth coded 3D shape, the virtually shaded shape and the RGB appearance of the object are shown. Our method can recover accurate geometry of translucent objects, which is otherwise challenging to measure.